"Would like more services in the future." 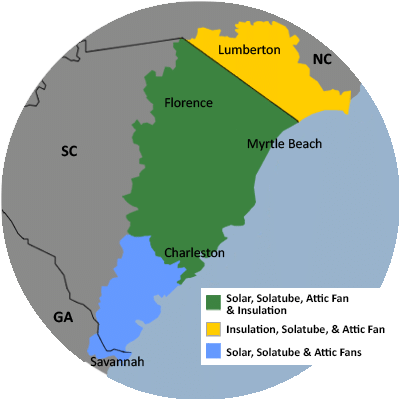 For a FREE no-obligation estimate in Beaufort County, SC, please fill out the form to the right and Carolina Energy Conservation will contact you shortly. Very happy with Solatube and the entire purchase and installation process. Extremely professional company and knowledgeable, efficient installer (Peter). Give him a raise! He was great. Thanks!! William T. Mystic Point Dr.
Would like more services in the future. Donald K. Commodore DuPont St. I was particularly impressed with the work performed by my installation crew. The installation crew was amazing! Chris and Brandon worked liked troopers in our hot attic. They remained cheerful, conscientious, and well mannered throughout the process. They are definitely an asset to this company. Everyone we met worked hard and were very friendly. 4 rating is because of incorrect screw installation in solar tube project. A second visit was required to correct this. Eliminate Dust problems. Install Solar Tube in Kitchen area to brighten the area. nice to deal with a company that is happy to work with their customers. We specialize in a variety of services aimed to lessen your home's carbon footprint and save energy and money each month! We offer it all, from air sealing to ductwork to insulation and HVAC services in Beaufort County, SC. For a FREE, no-obligation services estimate in Beaufort County, SC, you'll also receive a free copy of "Saving Energy and Money at Home," a great book to use as you begin to create a more comfortable, healthy, and energy efficient home! Now this customer is saving money and shrinking their carbon footprint. These sleek looking panels look great on their rooftop! Ted wanted to save on his electric bill all while reducing his carbon footprint and doing his part to save the planet. He decided to go solar at his home! Ted had a 4.550 kWh system installed which consisted of 13 SunPower panels. This system is now covering ~98% of his energy usage and should save him about $45,000 in energy bills over the next 25 years! House built in 1997 and is drafty & cold in winter. A few years ago had SCE&G come out and inspect; they said some ducts needed to be repair. I used someone they recommended and they came out - don't know if they did the work properly - I'm not accustomed to walking on attic trusses. My electric bill is sky high. Building new house. Interested in blower door test. Excessive electric bill Old roof House built prior to 1970 Poor insulation in attic Original wiring in home Original air handler Thank you for your time! Need quote for a Solatube installed in a bathroom.